On Friday’s Hardball on MSNBC, the day after he labeled Colin Powell and Condoleezza Rice as "showcase appointments," Chris Matthews retracted his comment, chalking it up to a bad choice of words, as he contended that he should have called Powell and Rice "high-profile" appointments, rather than "showcase" appointments. Matthews: "I should have said 'high-level, high-profile' appointments. They were genuine appointments. They were not tokens." And, although Matthews did seem to demean Rice on Thursday by referring to her position of Secretary of State as a "nice title," Matthews on Friday used a different tone: "Nobody on Earth believes that Condoleezza Rice is not this President's chief foreign policy advisor. Or nobody challenges their ability. Personally, I love the guy, although I wish he'd had opposed the war, General Powell. So I used the wrong word. I should have said 'high-level, high-profile,' not 'showcase,' because some people took that as 'token.' And damn it, I certainly didn’t mean that." As previously documented by the MRC’s Geoffrey Dickens, with video, during Thursday night’s coverage of the Democratic Convention, Matthews remarked: "It's important to point out, as we have not so far, Barack Obama was not given this nomination, he won it. He was not offered a nice title like Secretary of State, like Condoleezza Rice got from the Republicans. He was not offered the title of Chairman of the Joint Chiefs as Colin Powell was, or Secretary of State. He won the nomination of a Democratic Party voting together. He defeated all other opponents and took the prize and took the leadership. He is the chosen leader of the Democratic Party. He is not some popular appointment or a showcase appointment." 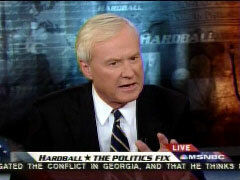 CHRIS MATTHEWS: I want to say something. I said something last night. I didn't like the way I said it. I want to say it better this time. I think it's very powerful when a political party gets behind somebody because they win the nomination, they beat everybody else, they take everybody else out – in this case, the important, the powerful, the candidacy of Hillary Clinton. When you win a nomination of political party, it’s far more powerful than getting a political appointment, even a very high-level appointment. And I compared the success of Barack Obama last night to the appointments of Condoleezza Rice and General Powell in the other party, in your party. And I used the word "showcase" appointments. I shouldn't have used that word. I should have said "high-level, high-profile" appointments. They were genuine appointments. They were not tokens. Nobody on Earth believes that Condoleezza Rice is not this President's chief foreign policy advisor. Or nobody challenges their ability. Personally, I love the guy, although I wish he’d had opposed the war, General Powell. So I used the wrong word. I should have said "high-level, high-profile," not "showcase," because some people took that as "token." And damn it, I certainly didn't mean that.